The game will show you what the player needs to practice. In the US Youth Soccer Skills manual coaches can find the basics of all ball skills. From this core set of techniques the growing player will be able to add on many variations and subtleties to the techniques. This fact most likely applies to players fifteen years of age and older as they fully mature athletically and come to understand how to use a variety of skills in varying game situations. Do not let the developing player’s game become obsessed with frills or skills that, while useful, are used rarely. Be competent in the basic orthodox techniques first. But once that standard has been reached then embroider the player’s skills with the less orthodox techniques as they are serious, positive skills which will help the team and not just please spectators. Players gain more trust and respect for a coach who can help them improve their technique. The result is confident use of new skills in matches. Motivated players spend time working on their skills. Players will appreciate the importance and thrill of learning new techniques and refining existing ones if the coach creates the proper training environment. Then the players begin to equate fun with improvement. Novice coaches often find themselves in a Catch 22 at training sessions. They can influence young players by helping them develop techniques, but some coaches don’t know enough about the techniques they are teaching to offer relevant advice. PREPARATION – the movements leading up to contact with the ball. CONTACT – the placement of the feet and the posture of the body upon contact with the ball. FOLLOW THROUGH – the movement occurring after contact with the ball. Yet before a player can learn soccer skills the child must first learn how to control the body’s movement, so the foundation to ball skills is physical education. Motor skills (physical movement/body mechanics) are refined from early, gross actions to highly coordinated and complex movements. This developmental trend of simple to complex and gross to fine is the basis of all motor development. Motor movement is the collective action of the muscles and tendons to move the ligaments and bones. Gross motor skills refer to movements of the entire body or major segments of the body. Fine motor skills refer to movements requiring precision and dexterity, such as manipulative tasks done with the feet or hands. Basic motor patterns of the body are established in the gross motor phase and motor skills emerge in the fine motor phase. Motor pattern – basic movement involved in the performance of a task. The emphasis is on the movement composing the task. Motor skill – focuses on the proficiency of completing the task. Motor skill looks at accuracy, precision and economy of the performance. In general when analyzing a player’s technique start with observing the feet and work up to the head. Correct body mechanics increase the likelihood of proper ball contact. Body posture plays a large role in skillful control of the ball. The “position of readiness” cannot be overemphasized in its importance to executing ball skills. The “position of readiness” is the preparation phase mentioned previously. The body posture and alignment with the ball are crucially important and often overlooked by coaches and players alike who focus too much on the contact phase. The foundations to any “position of readiness” are the non-locomotor and locomotor actions. They are balance, agility, twisting, bending, along with stretching and eye-limb coordination among others. Before a player can be expected to learn ball skills the child must first be under control of the body. This growth in athleticism, from gross motor skills to fine motor skills, is a long term growth process. It is imperative for children to acquire a base of general balance, coordination and agility before soccer skills. How can coaches expect them to control the ball before they can control their bodies? So it is essential that youngsters be exposed to movement education. This requirement is of primary importance to the youngest players and ball skills are of secondary importance. Running and jumping are the two most often executed movements in soccer. Teach jumping to improve performance and to reduce the possibility of knee injury. The jump can occur from a stationary position or while on the move. The approach run should be made in the direction in which the player intends to receive the ball from or propel the ball towards. Lengthen the final stride and the center of gravity should be lowered somewhat. Press against the ground with the heel of the foot of the take off (drive) leg. By straightening the trail leg the body weight is transferred onto the lead leg which is slightly bent at the knee. By straightening the take off (lead) leg and by pulling up the knee of the trail leg vigorously the body will leave the ground. The arms can help in the upward momentum by swinging upwards close to the torso. If the take off space is tight because of the presence of other players then the final two strides should be stutter steps to be able to change the momentum from horizontal along the ground to vertical into the air. The legs should be held in a lunge position. To ensure a soft landing the knees should bend a little as the balls of the feet touch the ground; followed by the arch of the foot and then the heel. Players jump in a soccer match to hurdle over another player on the ground, to avoid a tackle, to receive or strike the ball; to head the ball or for a goalkeeper to catch, punch, or deflect the ball. The ability to judge the speed and the arc of the ball, while making a split-second decision on the timing and takeoff point of the jump, will mark the above average player. Undoubtedly the basis of good play in the air is jumping mechanics. Acquaintance with locomotor and non-locomotor activities lays the foundation for all of the movements and skills in soccer. This requires an underpinning of physical education during the first ten years of a youngster’s soccer life. That foundation is non-locomotor (not moving from one space to another), locomotor (moving from one space to another) and manipulative (controlling a ball with the hands or feet) actions. A youth soccer coach should be able to observe a player’s movements and assess the quality of those movements, which in turn affect the caliber of ball skills. It stands to reason that as athleticism grows within a player then too the odds for good performance of ball skills increase. This means for the soccer coach ball skills and physical education go hand in hand. 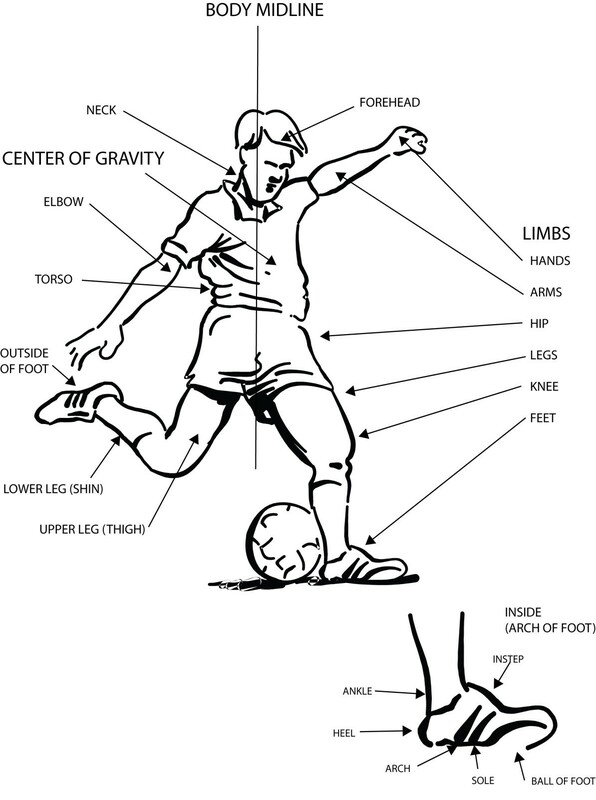 One must be able to observe and assess motor movement when children play soccer. When assessing the quality of performance the process of movement deals with the technique of completing a specific movement in terms of its components (hip rotation, arm action, etc.) and the specific elements of the performance (angle of takeoff in a jump, length of lever arms, etc.). The product of movement concerns the result of the action, the height the child jumps, the time elapsed in a dash, as examples. In general, but not always, the process and product of a motor performance are related. Good performers in terms of the product usually demonstrate proficiency in the movement process. In other words the player in good control of his or her body motion is more likely to be skillful. This is why movement education is important during the soccer player’s childhood years. A knowledgeable coach realizes that every player goes through a sequence of learning and performing the movement patterns mentioned above while on the pathway to achieving adult patterns. The achievement of developmental milestones cannot be predicted based on age, size, weight or strength. The rate of mastery of skills varies widely. From infancy, development progresses from the head to arms to torso and then to the legs. So proficient ball skills can only come after full control of the lower limbs is reached. For example if a kick is divided into its various separate yet combined movements, certain distinct phases can be differentiated. Separation of this kind is very difficult since a kick is a continuous series of movements. However it is important to deal with the components of the basic action of kicking, since if a coach is familiar with them it is easier to observe and correct faults or to reinforce correct patterns. Here then are the stages in growth from kicking a soccer ball to passing or shooting one. Stage 1: Initial position – with two legs together, ball in front of a foot. With no leg windup or arm movement the child pushes the ball from a stationary position. After the kick he or she steps backward to regain balance. By age two most boys and girls reach this stage. Stage 2: Initial position – with two legs together, ball in front of a foot. The child begins the kick from a stationary position, but in preparing to kick, there is both a leg windup to the rear and some opposition movement of the arms and legs. Balance is recovered by stepping backward or to the side. Most boys achieve this stage by age three and a half and most girls by age four. Stage 3: Initial position – several steps behind the ball. The child takes one or more steps to approach the ball. The kicking foot stays close to the ground until the moment of contact. After the kick the child steps forward or to the side to regain balance. The forward momentum used during the run up propels the body forward after the kick. Most boys achieve this stage by age four and a half and most girls by age six. Stage 4: Initial position – several steps behind the ball. The child approaches the ball with several rapid steps, leaps before the kick and usually hops during the plant onto the support leg after the kick. The body generally reclines during the windup. Most boys achieve this stage by age seven and most girls by age eight. By contrast here are the mature kicking features of the older player. A talented soccer coach guides a player’s development both athletically and technically. Therefore the coach must be familiar with not only the sequence of physical growth, but also the properties of the ball. Coaches must teach the qualities of a rolling ball, bouncing ball and the flight of the ball, in that order! The teaching progression is a ball rolling away from the player, a ball rolling towards the player and a ball rolling across the player’s body – first from the player’s dominant to non-dominant side and then the reverse. The same progression applies to a bouncing ball. Coaches need to get across when to play a bouncing ball, which for field players is once it has dropped below knee height or to jump in order to get level with the ball (line A in figure 7) to play it sooner. A bouncing ball may also have spin to it which makes reading the direction and height of the bounce difficult. Additionally a ball hitting the ground may take on new properties of pace, spin, height or roll depending upon the surface conditions of the field. Teach how to read the spin and swerve of a flighted ball. For example a ball in the air that spins to the left will fly to the left. The teaching progression for spin is right to left, left to right, back to front and front to back. With swerve the teaching progression is flat flight, arc flight, out- swing, in-swing and dip. Understanding which part of the ball to contact is crucial to the execution of many techniques. In figure 7 the ball has been divided by two lines A and B. They are the axis lines of a sphere. When the ball is struck above line A then it will be propelled downward, which could be important in a side volley shot on goal as an illustration. When the ball is struck below line A then it will rise and this is important for a lofted pass for instance. When the ball is struck to either side of line B then the ball will swerve, which is important in bending passes for example. The better a coach understands the properties of the ball, its sections and aspects of its movement, then the coach will be able to read the movement of the ball as the player propels or receives it. By reading the ball action the coach can then guide the player toward improved technique. A ball rolling on the ground has an immediate backdrop to it. This backdrop makes it easier to judge the pace and spin of the ball. A bouncing ball infrequently has an immediate backdrop; at the moment it touches the ground. A ball in the air has no backdrop. Prior to age 9 visual tracking acuity is not fully developed. Players have difficulty accurately tracking long kicks or the ball off of the ground. Beginning at approximately age 10 the visual tracking acuity achieves an adult pattern. Armed with the knowledge of motor development and the properties of a ball the coach is now ready to teach activities which bring out the game in the child. It is easier to control a ball when remaining in a space as compared to controlling the ball while moving to another space or moving to a ball before it is received. It is easier to strike a stationary ball than a moving one and when standing still or moving slowly as compared to moving fast. It is easier to accurately propel the ball to a close target (teammate or space) than a distant target. It is easier to accurately strike a large ball than a small ball. When catching/receiving with one hand/foot it is easier to catch/receive a ball that fits the hand/foot as compared to a large ball. It is easier to catch/receive a straight, slow moving soft ball than a curving, fast moving hard ball. It is easier to do an activity with the dominant hand or foot than with the non-dominant hand or foot. It is easier to move at ground level than to move when airborne. It is easier to perform alone than to move in synchrony with a partner or group. It is easier to perform an activity with few or simple rules as compared to activities with many or complex rules. By using this information a coach begins identifying easy and complex activities. The identification of activity difficulty is important in planning movement experiences and making adjustments to movement experiences when the activities planned for the training session are judged by the coach to be too difficult or too easy. The selection of activities with appropriate levels of difficulty is an important part of developing a progression for an effective training session. Principle of Interest: A player’s attitude toward learning a skill determines for the most part the amount and kind of learning that takes place. Principle of Practice: Practicing the motor skill correctly is essential for learning to take place. Principle of Distributed Practice: In general short periods of intense practice will result in more learning than longer, massed practice sessions. Principle of Skill Specificity: A player’s ability to perform one motor skill effectively is independent of his/her skill ability to perform other skills. Principle of Whole–Part Learning: The complexity of the skill to learn and the player’s ability determines whether it is more efficient to teach the whole skill or break the skill into component parts. Principle of Transfer: The more identical two tasks are the greater the possibility that positive transfer will occur. Practice conditions should match the conditions in which the motor skill is going to be used. Principle of Skill Improvement: The development of motor skills progresses along a continuum from least mature to most mature. The rate of progression and the amount of progress within an individual depends upon the interaction of nature and nurture. Principle of Feedback: Internal and external sources of information about motor performance are essential for learning to take place. Principle of Variable Practice: Block practice aids performance while variable practice aids in learning. Variable practice causes an increase in attention.